If you are posting please allow several days for delivery. All Bookings whether Online or Manual must be complete in all detail and be accompanied with payment including Food Store Deposit. Payment is to be by cheque (or Money Order) payable to Elouera Ski Club Ltd or by Credit Card (Visa or MasterCard only). We do not have a Bpay or Direct Deposit facility. Credit Card details for online bookings or bookings totally paid for by credits may be faxed to 02 9875 2706. (You may pay by CASH if you wish, but these applications must be hand delivered). Payment for these bookings will not be processed till after 3rd March, when bookings have been successfully allocated. Members are reminded that they do get bonus points for taking non members to the Lodge, however the responsibility for that guest’s behaviour rests with the member. If you have previously booked someone in and they have caused a problem, please do not book them in again as it takes up considerable time and effort to straighten out all the issues raised, and we have enough to do without these problems. If you pay by Credit Card any refund of food store or any other money will be deposited back in that same Card, as long as it is still current. CAUTION The status of our telephone at the lodge after May appears to be that you may receive incoming calls but outgoing calls will be limited to local calls only or you may use phone cards or telecards (mobile reception is almost non existent). This is a result of Telstra upgrading their network to be run as a world standard organization. For those people who require email contact with the outside world while at Charlotte pass Email access is available at the Chalet. Food Store Refunds if not sorted by the Lodge Captain are paid by the Treasurer to the person whose name appears on the Food Docket and posted to the address that is on the food docket if a deposit was paid by Credit Card then it goes back into the card that it came out of, or a cheque is posted to the address that is on the food docket, i.e. no food docket no refund. NB no address no refund straight away, as it may take quite some time to find your address. (I know perhaps it may be on your booking form in the archives, so we might be able to find it one day, (as long as you are the one who made the booking)). This winter’s lifts, equipment, and lesson packages are now available – discounts are available for early purchases but remember NO REFUNDS or credits for future years no matter what the reason or excuse, so if you buy a package the moment you pay for it your money has gone. This is the direction from CPV, so read the details carefully. New categories for ages this year for packages a child is 13 years and under – an adult is 14 years and over – a senior is 65 years and over. Last year for the last week of the lifts we offered a $100.00 cash back and it’s on again this year. For Packages or Lift Tickets shorter than the week - Cash Back will be on a proportional basis ($15.00 per Day) max $100.00 per guest. NB an additional 5% Discount on packages is also available for persons buying the package from CPV more than 14 days in advance. Should you be visited by any of our little furry friends this winter (we do have an Elliott Trap in the Lodge and they seem to like peanut butter), so if you manage to catch one, (either a Pygmy Possum or a Dusky Antechinus they are both about the same size (similar to a mouse)) please ring National Parks and Wildlife and ask for Dave Woods, he will brief you on what to do and will probably come up to the Lodge to do the rescue. Pygmy Possums (Burramus Parvus) built up body fat in summer to enable them to hibernate in winter (their body temperature drops to about 2 degrees C) and should they come out of hibernation in winter they tend to burn up their excess body weight, so to put them back outside, if they have lost too much weight is not very kind (i.e. the poor little buggers will probably die). So a call to Dave at NPWS will probably save its life and you will feel good about helping to saving a life. Oct 25 / Nov 2 2008 Work Party at Pygmy Possum Lodge. A small but dedicated team undertook maintenance and improvement tasks at the Lodge to improve its operation over the summer period. A team of four members and two friends made themselves available for this work party, the next work party is proposed for 22 March to 4 April 2009, a request is made for members to consider making themselves available to assist in the maintenance of the lodge during these 2 weeks (preferably for at least a whole week). We need to do tuck pointing and painting, both inside and outside. There are always many minor jobs to be undertaken. If you can assist during this week please contact Peter Quinnell, on 02 9521 4562. Replacing all the bearers in the top platform of the entrance, this entailed removing the decking and then demolishing the seven badly weathered bearers, replacing them with new hardwood bearers, giving them a protective coat of Sikkens Cetol HLS Wood Finish, before nailing the original decking back in place. Some deteriorated timbers in the railing were replaced; both the top level western side load bearing railings were replaced, as was the lower railing on the eastern side. All of the entrance was given a coat of paint at the completion of the building work. 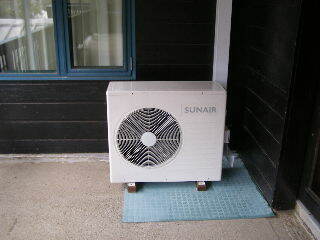 Two new Heat Exchangers (Split Type Room Air Conditioners) were installed, one in each wing, these units have their outside unit located on the verandah outside the games room doors, the inside unit is on the wall adjacent to the window. 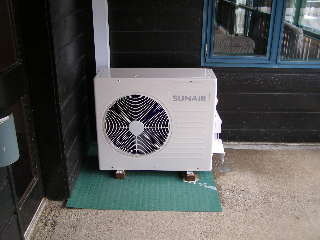 These units have been installed on a two year trial as replacements for the oldest storage heaters in the dining rooms. It is expected that they will give more heat output than the storage heaters thereby reducing our heating costs. The outside units are to be respected by our zealous snow shovellers as any damage could result in thousands of dollars worth of cost. 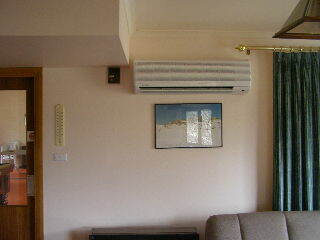 Units are to be used for HEATING ONLY. The Recirculation Water heater in the East wing was found to be leaking on arrival of the work party; luckily we had a plumber present and a large trailer available. Two new units were purchased in Jindabyne and transported to the lodge. The cost of these units were $1034.00 each, plumbing parts to install the unit in the east wing drying room was $60.00, if we had to have employed a plumber the labour cost would have been a further $640.00. The second unit has been stored under the stairs in the East wing entry. As seven other units are over twenty years old it is now expected that others may fail in the near future and winter delivery would have to be done by helicopter. Repairing the West wing drying room door. The bottom hinge was bent preventing the door from closing. The probably cause of this was that the door was forced with some obstruction on the floor between the door and the door jam, by someone unknown. Inspection hole cut into the wall above the Ensuite in room W10, water had entered the ensuite light fitting; however no visible sign of a water leak was found. We need to keep this under inspection. The east wing ground floor toilet fan was noisy and was replaced, in this task it was discovered that the Infra red Scanner switching on the light and fan was faulty, this scanner was replaced with a HPM Excel Automatic Light Switch XL632. Both wing bedroom ensuites were inspected for leaks, broken or cracked parts, correct shower operation and correct fan operation. Ten were fitted with new washers in the shower heads, the washers were missing, presumably lost when the heads were interfered with. Replaced two faulty toasters, one in each wing. Replaced old saucepans and frying pan with six sets of Baccarat 18/10 Quality Stainless Steel 6 piece cookset with 2mm cooper base. Included are 1.8L, 2.7L & 3.6L saucepans with lids, a universal steamer to fit all three saucepans, a 24 x 4.5cm frypan, 24 x 10cm / 4.5L Dutch oven with lid, this lid fits the frypan. Noisy fans cleaned and oiled, noise removed. Hot & cold taps were replaced to Raymor Tapware as original cold tap handle was cracked and breaking. Original tapware now not available. Entry door to a bedroom from hall door not closing properly due to split door jam and hinge not secure. Removed door and architrave, glued two splits, securing with six 10g x 6mm long chipboard screws. Refitted door and architrave. A reminder that there are spare keys in the lodge and there on no need to smash the door in. All ensuite and ground floor toilet fans have now been fitted with pluggable connections to allow for easier fan changing. All heaters had already been fitted with a plug and socket connection. These units can now be changed without the need to touch the electrical wiring. East and West wing quiet lounge side doors, top slide bolt recessed more to allow for firmer closure of door, in an attempt to prevent water entry. West doors also filled with an additional length of door seal on lock edge. East wing top rear fire escape door, door tread badly split and rotted, nailed with three 130mm x 6mm gal nails to support remaining timber, filled and painted. All entry door treads scraped back and painted with green paint. All hand rails painted after a rub back. East wing quiet lounge West door to deck, outside painted with Sikkens Cetol HLS Wood Finish, wall touched up with same. All pillow protectors, mattress protectors and bath mats laundered in all west and east wing bedrooms, remade all beds. 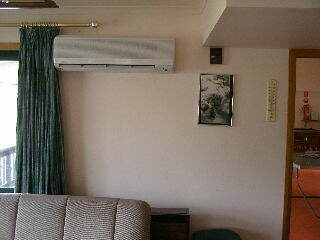 Cleaned all lounges in both dining rooms, both quiet lounges and ground floor entry foyers with Vax Vacuum cleaner. Replaced two faulty toasters, one in each wing. Replaced old saucepans and frying pan with six sets of Baccarat 18/10 Quality Stainless Steel 6 piece cookset with 2mm cooper base. Included are 1.8L, 2.7L & 3.6L saucepans with lids, a universal steamer to fit all three saucepans, a 24 x 4.5cm frypan, 24 x 10cm / 4.5L Dutch oven with lid, this lid fits the frypan. Supplied additional coffee mugs, wine glasses, liqueur glasses and tumblers, to replace broken and missing items. Purchased new kitchen utensils, microwave bowls, chopping boards, to replace missing and broken items. Supplied new storage containers for the community food cupboard, these containers are for the opened packets of flour, rice, icing sugar etc, as all opened packages must be in a sealed container. Reallocated crockery and cutlery equally between both wings again. Cleaned all six sets of drawers in the kitchens, defrosted the freezers. New waste bins have been provided in the kitchens to replace the existing bins, they are colour coded to match the Charlotte Pass large bins. See instructions from Alexander Bailey. Undertook Food Store and Cleaning Cupboard stock take. MISSING ITEMS: It has been noted that several items have been removed from the Lodge by persons unknown at this stage (any information about their disappearance would be greatly appreciated), these items include: - The framed Charlotte Pass Village Photo from the West Wing, a framed photo of a group of members skiing down towards the ruin (not all of these members are with us today), vacuum cleaners, and items from the food store (including drinking chocolate). Items supplied by the club as community items are for guests use only when they are staying in the lodge, again information as to the offenders would be greatly appreciated. MISSING KEYS: We still have some keys out there somewhere that have not been returned yet, and while you are sending the keys back you might also have some food dockets, so maybe you could send them back too, then the Treasurer might be able to get around to fixing up some food refunds that have not been processed yet. If you are the last booking and nobody is following you in, ALL DOORS ARE TO BE LOCKED.- 4 Rear Stairwell (2 each wing), 2 rear kitchen (1 each Wing), 2 Dining Room to Front Balcony (1 each wing), 3 outside doors in Games Room and of course the Front Door. Please check both wings even if you did not use the other wing. There is no problem for the doors to be left unlocked while the Lodge is occupied. For some reason it seems to have been a past practice to leave 1 kitchen door unlocked to allow easy access to the building when the Lodge is unoccupied. This is not to continue, so if you are the first in please check that all doors have been locked, if not please report it back on the toll free numbers immediately (they will still operate after the Telstra downgrade / upgrade). If you arrive at the Lodge and you find it is already occupied by somebody that is not on your bed allocation, likewise ring back immediately, do not challenge them as they are probably genuine guests and this could spoil the rest of both yours and their stays as well, we do get last minute bookings. If arriving early, please ensure that your luggage is left in the games room. This will make it easier for guests/members who are leaving to finalise their packing and cleaning. Guests/members arriving early should not attempt to move into their allocated accommodation until 12.00 noon, you can however take up your accommodation if it has been vacated early. When ready to leave take your luggage down to the area outside the Drying rooms until near the time of your transport departure then move it out to the road ready for loading. Please introduce yourself to the Lodge Captain if you have not met previously and assist the Lodge Captain in making everyone’s stay at the Lodge enjoyable for all guests/members.